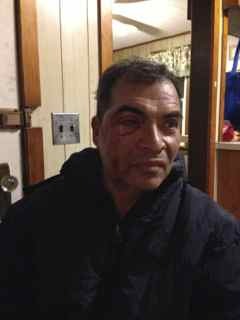 Lazaro, one day after a bull attacked him at the dairy farm where he worked. Lazaro and David are two dairy farmworkers who have been injured at dairy farms in NY. These are their letters in support of the OSHA local emphasis program on dairy farms. They were published today in the Syracuse Post Standard website. Both of them have participated in the Workers’ Center of CNY and the Workers Justice Center of NY efforts to improve working conditions for dairy farmworkers in NY State. Recently I was part of a group that met with the editorial board of this newspaper. In the meeting we presented information, and my testimonial and that of another worker, so that the newspaper would be informed and would support the Local Emphasis Program on dairy farms that OSHA recently started due to the high incidence of accidents and deaths on dairy farms. The program educates the owners of dairies in how to comply with the occupational safety and health standards, and also includes a provision for the implementation of surprise inspections. Seeing the opposition of the farmers and politicians to this program, which we believe will be a benefit to workers, we have organized ourselves to educate the community and ask them that they don’t ignore those of us who are an enormous help to the economy of this state. In the meeting we hoped that our testimonials would be brought to light, and that the newspaper would support us to achieve safer workplaces, but it wasn’t like that. It’s because of this that I am now writing. In September of last year, I was the victim of an accident on a dairy in Upstate New York. A bull attacked me while I was pushing cows to be milked. I suffered blows to my body and my face and I almost lost my right eye. Two weeks later my employer fired me. I was unable to work for a number of weeks. I was living from the generosity of friends and facing a great number of obstacles to receive medical treatment. Unfortunately my experience is very common on dairy farms and in general in agricultural work. Since we come here to work from other countries we are not familiar with our labor rights, or we don’t exercise them out of fear of retaliation, or simply, as in my case, when we get hurt we get fired. Here I give you a list of my experiences of having worked in a number of dairy farms in New York. The insecurity starts with animals because we don’t receive training, and many times they don’t even tell us that there are bulls mixed in with the cows. Inside the facilities, the gates, the doors and the corrals are in bad condition. We often use chemicals and they don’t tell us what they are or what to do in case of an emergency. The same thing happens with the operation of machinery like tractors, skid steers, etc. They don’t give us protective equipment and in many places we have to buy something so basic as gloves ourselves. In addition to health and safety problems, there are many others like wage theft, unsanitary housing and overcrowding. It has to be added that the workdays are from 12, 13 up to 14 hours every day with one day of rest, and sometimes not even that. In some places they don’t respect even a half hour for us to eat. In a case like when I got hurt, they don’t even have workplace insurance. Until now I still have not received any economic benefit related to workers’ compensation. It’s not surprising that there would be so much opposition to the inspections. I don’t want to generalize, and we understand that there is fear toward OSHA and their fines, but OSHA is giving many months to the farmers so that they can educate themselves and learn what they have to fix. The inspections only cover a very small sample of the dairies. We came here from other countries to work on dairy farms so that our families can get ahead. Many of us have been in accidents on the job and the boss doesn’t offer help. That’s what happened to me. It was sad that I didn’t receive the help I needed, and that I was left basically on my own. This was the second dairy farm I have been injured on due to the unsafe conditions that exist. I support the surprise inspection campaign that OSHA is implementing right now. If the dairy farmers would only stop and think about how hour after hour they are making money thanks to our labor, that we are people equal to them, and that if they were doing things right, they wouldn’t be scared of an inspection. To the politicians, the government, the media: I ask you please, don’t ignore us anymore.